2 Darren Tay Wen Jie World Champion of ‪Public Speaking 2016 Full Speech, “Outsmart; Outlast”. 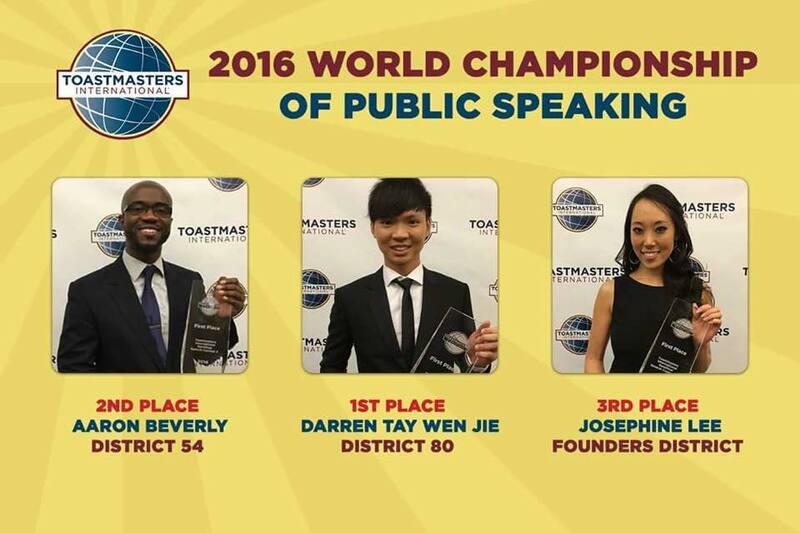 Congratulations to Darren Tay Wen Jie of Singapore, District 80, on becoming the 2016 World Champion of Public Speaking. Congratulations to Aaron Beverly of Pennsylvania, District 18, on finishing in second place. Congratulations to Josephine Lee of Founders District in California, on finishing in third place for her speech. Darren Tay Wen Jie World Champion of ‪Public Speaking 2016 Full Speech, “Outsmart; Outlast”. Here’s a breakdown of the speech that won the 2016 World Championship of Public Speaking. Singaporean lawyer wins international public speaking championship. Here is another press release about the event. 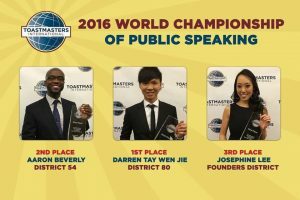 This entry was posted in Public Speaking News, Toastmasters, Video and tagged 2016, Aaron Beverly, Darren Tay Wen Jie, Josephine Lee, public speaking, Toastmasters, Video, world champions on August 25, 2016 by admin.